Laying the foundation for a worry-free data center, HGST delivers capacity to conquer the data explosion – Ultrastar He12 HDD. Designed to handle workloads up to 550TB per year, the Ultrastar He12 HDD is the industry’s first 12TB drive and uses PMR technology to make it drop-in ready for any enterprise-capacity application or environment. The stable internal environment created by fourth-generation HelioSeal technology enables a new 8-disk design, increasing the capacity by 20% when compared to the 7-disk design of the prior generation. This highest capacity helium drive offers the lowest power profile in the industry to help data center architects meet eco-environmental goals and requirements. 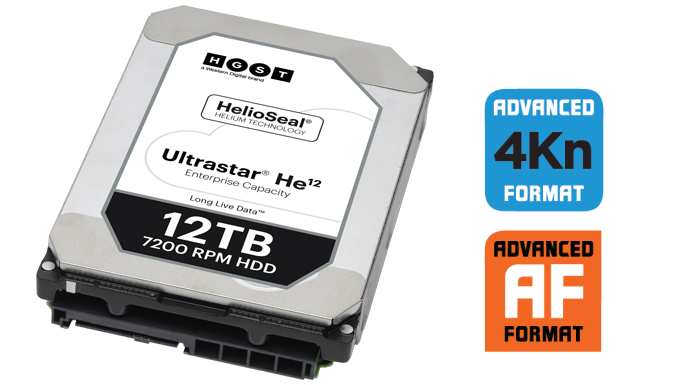 Targeted at 2.5M hours MTBF, the Ultrastar He12 HDDprovides the highest reliability rating available of all HDDs on the market today by building on the successful design of its 10TB, 8TB and 6TB predecessors. Trust HGST and the Ultrastar He12 HDD to deliver more capacity, more efficiency, more reliability and more value to your data center. Data centers are facing growing pressures. Data volume is expanding, operating costs are rising, yet budgets remain flat. Lowering the total cost of ownership (TCO) has become the focus of data center architects and the Ultrastar He12 HDD provides the best value proposition and greatest storage efficiency available. Compared to 8TB air-filled drives, this HelioSeal hard drive provides 50% more capacity, uses 54% less power (Watts/TB), and is 25% more reliable, rated at 2.5M hours MTBF. Data-center ready features like a second generation dual-stage actuator — the HGST Micro Actuator — enhance headpositioning accuracy to deliver better performance, data integrity and overall drive reliability, especially in multi-drive environments where operational vibration is present. Refer to our HMA technical brief to learn more. A choice of 6Gb/s SATA and 12Gb/s SAS interface enables easy integration into high performance data centers. As drive capacity grows beyond single-digit TBs, object storage systems with erasure coding provide better data durability compared to RAID systems, given its tolerance for simultaneous error conditions. The Ultrastar He12 HDD is a best-fit for object storage implementations with its massive capacity and industry-leading reliability rating. Compliance and privacy requirements drive the need for increased data security. The Ultrastar He12 HDD offers security and encryption options to help protect data from unauthorized use, including TCG options on both SATA and SAS models. 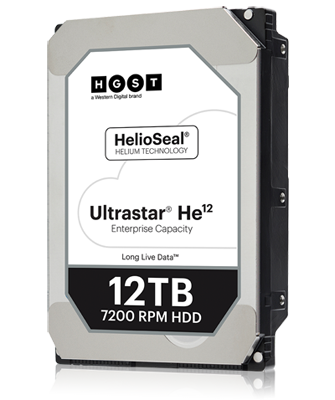 The Ultrastar He12 HDD extends HGST’s long-standing tradition of reliability leadership with a 2.5M-hour MTBF rating and a 5-year limited warranty. Ultrastar quality, capacity, power efficiency, and world-class technical support and service provides customers with a lower total cost of ownership over previous generations. HGST drives are backed by an array of technical support and services, which may include customer and integration assistance. HGST is dedicated to providing a complete portfolio of HDD, SSD and systems to help the world harness the power of data. Newer Feature on SATA HDDs: Power Disable Pin (Pin3) is a feature in the SATA 3.3 industry standard specification (published in February 2016). If you have a new chassis or system that supports this feature, you may want to use the part numbers below which support this feature. If you don't need this feature or don't know, we recommend selecting drives from the table above.